Is holiday spirit in our blood? It must be, seeing as how I can’t think of any other music—except perhaps for nursery rhymes—as deeply known by everyone from mass murderers to grandmothers. Why, then, do Christmas carols make us ache? Why do I cringe each year in early November when I find myself singing along in Crate & Barrel with in-store overhead renditions of whatever current recording artist has reinterpreted “Jingle Bells”? Sometimes I catch myself humming “White Christmas” in July, unconscious, giddy. I’m always told to shush. On the opening, “Silent Night,” the babies’ ­various calls are arranged and rendered over MIDI-sampled strings, woodwinds, and various other goo-goo caco­phony: birdcalls, musicboxes, some kind of psychedelic harp. Mostly, though, the music is just a minimal backdrop for the carefully collaged voices of the babies themselves. Many of the babies sound very sad and sob in a way that reminds me of rubber duckies squeezed in soapy water, while others coo in delight or bubble ­spittle. Sometimes they sneeze, or whisper “Mommy.” Sometimes they almost actually sing. A man named Mike Spalla spent many hours in a small room arranging babble into melodies that, like some sort of Christmas miracle, actually resemble songs we’ve spent years trying to ignore. His label, Jingle Cats Music, has also released several other Xmas mashups, including Jingle Cats Meowy Christmas, Here Comes Santa Claws, and Jingle Dogs Christmas Unleashed. There’s even a Jingle Cats role-­playing videogame known as Jingle Cats: Aito Yujono Neko Monogatari, Love Para Daisakusen, in which the object is to breed and care for cats, which begin to sing when they’re done copulating. The Jingle Babies’ effect, though, is monumental. Put this record on at a Christmas party and watch the way it takes control: everyone shuts up. They’re all looking off to nowhere, heads cocked, paying very close attention. They look amused, confused, offended. Someone will invariably say “Aww” or “That’s cute,” but by the middle of the second song, people will tackle you to reach the stereo. They will take you by the hair. I’ve had people ask me to pull over and let them walk—yes, I sometimes listen to Jingle Babies in my car. A brief aside: in the seventeenth century, the ­British Parliament under Oliver Cromwell outlawed the singing of Christmas carols under the premise that they were sinful. In the case of the Babies, I have to agree. I’ve found myself, many times, laying on the floor of my apartment, listening to “We Three Kings of Orient Are” for the fiftieth time, inexplicably mesmerized by their caterwauling, thinking of the horrified toddlers propped on Santa’s knee at the mall, of every baby born into a new season of secondhand Christmas tunes. This is children’s music? These are hymns drawn up from years of timeless tradition? 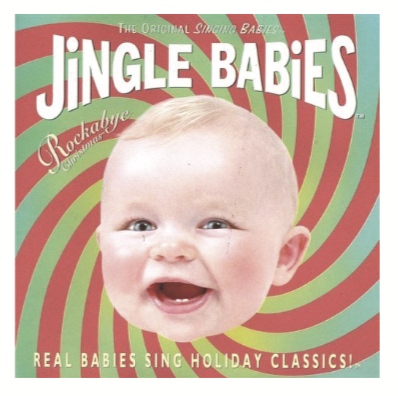 There’s something about these Jingle Babies that, while seeped in spirit, seem to spit—to take “cute” and “cheery” beyond the point of detonation. I imagine these boggled carols funneled loudly into malls, sending people running from the Gap and Sharper Image back to hide inside their homes, to wrap the roof with enough colored light to keep the dark out, fearing what other kind of man might slide down the chimney.